just in time to capture some stunning photos of baby Encore enjoying his first snow. We enjoyed the sights here at our home, too. Monday evening our fellowship group met at our home. It is such a delight to have dear friends to share with. repeatedly into a crocheted bedspread which I also repaired. Saturday evening my brother and his wife came over for dinner. Sunday afternoon after church we all napped by the fire. with a bit of water, at 400 degrees for about an hour. it makes for a tasty, meatless meal. Meanwhile I cleaned the seeds. and sprinkled them with salt and pepper. at 300 degrees for about twenty minutes. They make a nice, healthy snack. and sprinkled them with herbed parmesan cheese. We do love toasted under the broiler bread! It all turned out to be a nice Sunday dinner. And a very nice week. 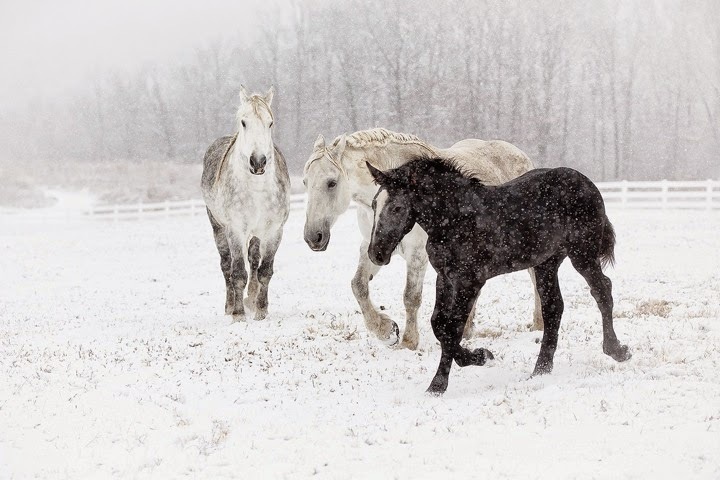 Linda, The composition of the first photo with the three horses is just beautiful! I would totally print that and make it your Christmas card this season. The horse photos were taken by my friend Becky who is a photographer extrordinaire! She gave me permission to post those two pics. Hopefully she will use them to create Christmas cards and send me one! I think I like the pumpkin seeds better actually. Let me know what you think. Wow..love the horse photos. 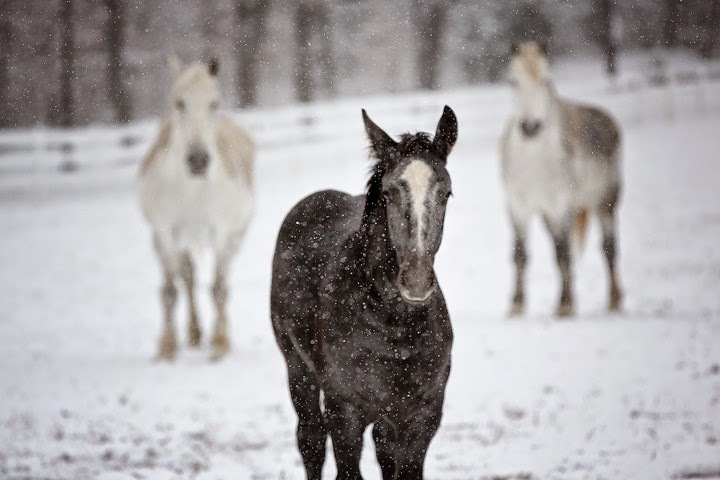 As a portrait photographer, I photograph mostly humans, but I think I might call upon a friend of mine that has horses and go to the preserves when it snows. Gorgeous photography! I don't own horses, but do love to photograph them. Becky is an amazing photographer. It is her hobby right now, since she is a full time doctor. I am trying to convince her to be my official blog photographer, though! The bunting I made with a lot of little stuffed hearts purchased at various garage sales and strung on woven lengths of string & lace. Thanks! I love the quilt over the fireplace! It all looks so comfy. Thanks; too comfy--it makes me want to nap all the time!